For the first time in the history of the Larry H. Miller Tour of Utah professional cycling event, organizers will include several cities and venues in southern Utah. Of the 10 host venues unveiled today at a press conference in Cedar City, seven are first-time venues for the world-class, six-stage professional cycling race and community festival. The 2013 Larry H. Miller Tour of Utah will begin Monday, August 5 with opening festivities in Cedar City, and continue across the state for six days of racing, Tuesday, August 6 to Sunday, August 11. The Larry H. Miller Tour of Utah continues for a third consecutive year as one of the top professional cycling events in North America, a 2.1-rated stage race sanctioned by the UCI (Union Cycliste Internationale). Last year seven of the total 17 teams competed earlier in the year at the Tour de France. Known as "America's Toughest Stage Race", the Tour of Utah featured 38,500 feet of climbing over the 543 miles covered in six days in 2012. Spanning almost the entire length of the state, the Tour of Utah will begin in southern red rock country near world-famous Bryce Canyon National Park. It will finish among the alpine peaks of the Wasatch Front in northern Utah. The state is home to five National Parks and seven National Monuments; the Tour of Utah will have host venues near four of these natural treasures, three in the south and one to the north. Three Utah ski resorts will host either a stage start or a stage finish. The week of competition will include five road races and one circuit race. Detailed routes and race mileage will be announced in the coming months. This year marks the sixth consecutive year for host partners Salt Lake City and Snowbird Ski and Summer Resort. Park City returns to host the Tour for a fifth time. The epic climbing route for Saturday's "Queen Stage" will return for the signature finish at Snowbird Ski and Summer Resort, but will begin for the first time at Snowbasin Resort. Snowbasin Resort will also host the start for The Ultimate Challenge recreational ride, held earlier the same day as Stage Five of The Tour of Utah. "We've always had our eye on expanding the Tour to the southern part of the state, and with great fan, sponsor and community support, we've been able to do that," said Steve Miller, President of the Tour of Utah, and newly named COO of Miller Sports Properties. "Our fan base provided solid crowds every day last year, and we attracted widespread audiences watching the race live on FOX Sports Network and on the web with TourTracker. The Tour of Utah generated $14 million in direct economic impact for the state in 2012 and our race expansion is expected to have an even greater impact. 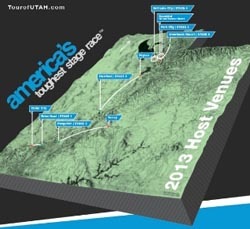 From Cedar City to Park City, we appreciate the support of all our 2013 host cities and look forward to the biggest year yet." The Overall Start on Tuesday, August 6 makes its debut at Brian Head, the highest resort town in the U.S. A premier winter destination in southwest Utah, Brian Head is surrounded by the alpine forests of the Markagunt Plateau, including the Dixie National Forest to the east and Cedar Breaks National Monument to the south. Brian Head is also the third highest incorporated community in the nation with a base elevation of 9,800 feet. Cedar City, known as "Festival City, USA", is a vibrant community 45 minutes to the west of Brian Head Resort. It is located on Interstate 15 approximately 250 miles south of Salt Lake City. Cedar City is the home to Southern Utah University and the Utah Shakespeare Festival, which gave the city its nickname and earned the regional theatre a Tony Award (2000). In addition to hosting the stage finish for Stage One, Cedar City will also present the Team Presentation Event on Monday, August 5. Stage Two will begin in Panguitch, just northwest of the entrance to Bryce Canyon National Park. It is part of the National Historic District and the county seat of beautiful Garfield County. The small agricultural community, named for the Paiute Indian word for "big fish", sits in a valley with rivers and lakes that is bordered by the Dixie National Forest. The official start line on Wednesday sits at 6,600 feet above sea level. Stage Two's finish will be hosted by Torrey, a small community situated in the heart of red canyon country in the shadows of 11,000-foot Thousand Lake Mountain. It is just 10 miles west from the unique geologic formations at Capitol Reef National Park. Torrey Town is best recognized by the 100-year-old cottonwood trees that canopy Highway 24 in the center of town. Stage Three will bridge the central region of Utah in Richfield with Payson in the Utah Valley to the north. Richfield is the largest city in south-central Utah, nestled in the high desert of Sevier County. This mile-high city marks the midway point in mileage between Cedar City and Salt Lake City. Surrounded by the beauty of the Fishlake National Forest, Richfield is an outdoor recreation heaven. The Stage Three finish will take the Tour to the south side of Utah Lake, where Payson rests in the shadows of the Wasatch Front. The scenery in Payson has made this a popular location for the film industry, as it was the location for "Footloose" and the television series Touched by an Angel. The Tour has passed through this section of the Provo-Orem metropolitan area in previous years, but this is the first time it has hosted a stage finish. Salt Lake City will return for a sixth year as the host city for Stage Four of the Tour. This Friday contest will feature a popular multi-lap circuit that will begin and end near the state Capitol. Salt Lake City Mayor Ralph Becker has declared 2013 as "Year of the Bike" and hosting a circuit race, similar to the challenging 80-mile route from 2011, is one of many planned events. Expanding and improving the "bikeability" of Salt Lake City is just one of the major aspects of Mayor Becker's Livability Agenda, a plan aimed at keeping Salt Lake City one of the best places to live, eat, work, play and do business. Last year Salt Lake City hosted two stage finish lines. Saturday's affair is known as the "Queen Stage", which is the grand day in the mountains for the climbers. Snowbasin Resort debuts to host the new start for Stage Five on August 10. During the 2002 Olympic Winter Games, Snowbasin gained attention as the host men's and women's Downhill, Super G, Combined and Paralympic ski events. As a warm-weather mountain sports venue just 20 minutes east of Ogden, Snowbasin offers mountain-top dining and many miles of scenic biking and hiking trails. The summit of Mount Allen reaches an altitude of 9,366 feet, while the base elevation of Snowbasin is 6,450 feet. provides close to 3000 feet of elevation gain over 6.5 miles (9.2% average gradient). Also new for 2013 will be the route for The Ultimate Challenge, a recreational bicycle ride for amateurs held the same day as Stage Five of the Tour of Utah. Snowbasin Resort will host the start of The Ultimate Challenge, beginning several hours prior to the start of the pro race. Amateurs will have several ride options that day, with the century riders finishing at Snowbird Ski and Summer Resort. Last year 604 amateur cyclists took part in The Ultimate Challenge. Stage Six will return to Park City on Sunday, August 11, the second consecutive year for the Stage Start and Overall Finish in this year-round resort town. Park City is home to three year-round resorts with the Wasatch Mountains rising to over 10,000 feet. A challenging stage race will be similar to 2012, with a final epic climb over Empire Pass. Expect huge crowds to pack Historic Main Street and see the champion crowned for the 2013 Larry H. Miller Tour of Utah for the grand finale. "We are excited to see the continued growth of the Tour of Utah that will now expand into the southern part of the state," said Jeff Robbins, president & CEO of the Utah Sports Commission. "The event generates significant economic impact for the state and will now be able to showcase Utah's red rock scenery along with the beauty of the northern part of our great state." The Larry H. Miller Tour of Utah began as a three-day Thanksgiving Point Stage Race & Cycling Festival over Memorial Day weekend in 2004. The Utah Cycling Partnership, owned by the Larry H. Miller Group of Companies, purchased the event in 2007 and re-launched the cycling event in 2008 as a five-day National Racing Calendar event. In 2011, the Tour of Utah was elevated by the UCI to a 2.1-rated stage race on the UCI America Tour. The race is also sanctioned by USA Cycling, Inc. The Larry H. Miller Tour of Utah continues to be free to all spectators, making professional cycling one of the most unique pro sports in the world today. More than 2,000 volunteer positions will be filled over the course of the week, and registration is available on the Tour's web site, www.tourofutah.com. Additional Tour updates can be followed via Facebook, Twitter and Vimeo. Deemed "America's Toughest Stage RaceT," the Larry H. Miller Tour of Utah is a weeklong, professional stage race for the best cycling teams in the world. Now in its ninth year of racing, the 2013 Tour of Utah will include some of the state's most beautiful and challenging terrain with lush forests and red rock spires in the south and the urban corridor and epic peaks along Wasatch Range of the Rocky Mountains in the north. In 2012 the race covered more than 500 miles and 38,000 vertical feet of climbing. The Tour of Utah is scheduled to take place August 6-12, 2013, as a UCI 2.1-rated stage race. A team presentation event will be held on August 5. The event is owned and operated by the Utah Cycling Partnership. Larry H. Miller Group of Companies continues as the title sponsor. Official Partners of the 2013 event include the Utah Office of Tourism, an agency of Governor's Office of Economic Development, and the Utah Sports Commission. For more information about the event, visit www.tourofutah.com. The Ultimate Challenge presented by the Larry H. Miller Tour of Utah is a non-competitive bicycle ride for individuals and riding buddies who want push themselves to their own endurance level and enjoy the ultimate road cycling experience. Participants will be treated to incomparable scenery, full logistical support and an official finish line at three optional locations. This ride will utilize the same route as Stage Five of the Larry H. Miller Tour of Utah and will take place the very same day, Saturday, August 10, 2013. The overall route starts at Snowbasin Resort near Ogden and ends at Snowbird Ski and Summer Resort. Stage Five alone offers 10,000 feet of climbing. Advance registration is required for several ride options, ranging from $80-$125 per person.